Scientists have known for years that mid-frequency sonar can harm deep-diving toothed whales, such as by driving them from feeding grounds. 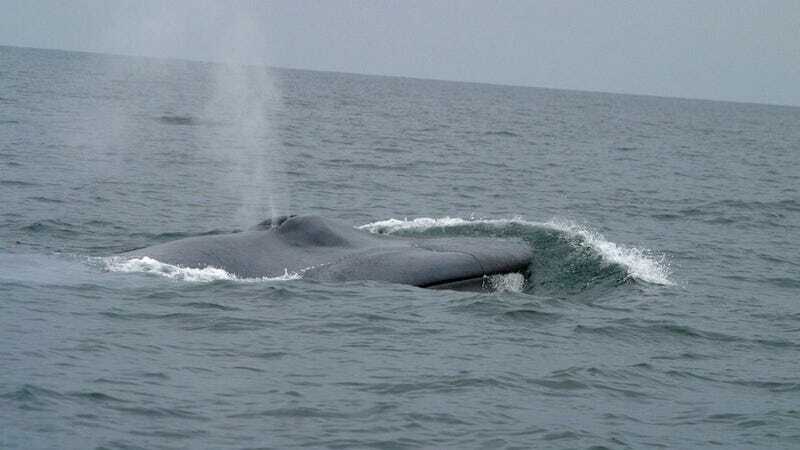 Research now shows that the naval noise even elicits stark behavioral changes in blue whales, which communicate at frequencies far below sonar frequencies, suggesting that the detrimental effects of sonar may be more widespread than previously believed. Marine mammals — whales, dolphins and porpoises in particular — rely on sound to communicate and navigate through their world. So it should come as no surprise that scientists have become increasingly concerned with the growing amounts of anthropogenic noise in the marine environment from shipping vessels, airguns (used for seismic exploration), military sonar and other sources. The noise pollution is thought to affect animals in a number of ways, such as by interfering with communication, damaging hearing and disrupting feeding habits. But data on the overall effects of anthropogenic noise, including what type of noise is worst for individual species, is still very much lacking. "There's so little basic scientific information about how animals respond to anthropogenic noise," says Jeremy Goldbogen, who is a biologist with Cascadia Research Collective, a Washington-based marine biology organization. "The research is very expensive and very difficult to do, especially for whales." Research has suggested that toothed whales (Odontocetes), which include beaked, sperm and pilot whales, are particularly affected by naval sonar. In addition to driving toothed whales from feeding grounds, mid-frequency active sonar (at 1–10 kHz) has been linked to mass stranding events (beaching) and mortality of cetaceans. Indeed, a study last month in the journal Nature reported that there has been zero mass stranding events in the Canary Islands since the Spanish government halted all naval exercises in the area in 2004. Just how sonar causes whale stranding is a bit of mystery, though some scientists believe the beached animals suffered from the bends (decompression sickness), Goldbogen tells io9. Studies have shown that stranded whales often have gas-bubble lesions inside their bodies, which likely arose from major changes in diving behavior and physiology. Although most stranding events associated with mid-frequency sonar involved toothed whales, several cases also involved baleen whales (Mysticeti), Goldbogen says. But because of the rarity of these cases, environmental reviews often discount the effects of the noise on baleen whales, sometimes also citing that the communication range of the whales are below the frequencies of military sonar exercises. So Goldbogen and his colleagues decided to find out if baleen whales do, in fact, respond in some way to mid-frequency sonar. The team, which involved scientists from a number of organizations, including the National Oceanic and Atmospheric Administration (NOAA) and the Naval Undersea Warfare Center, began by tagging 17 blue whales off the coast of Southern California. The tags collected a whole slew of information about the whales, such as how fast they were going, how their bodies were oriented in the water and how long their multiple dives lasted. The researchers then subjected individual whales to mid-frequency sonar or pseudorandom noise (with the same frequency) from at least 656 feet (200 meters) away. To improve safety, the sound started off at very low levels and then slowly ramped up in volume, though even the max volume didn't reach decibel levels used by the U.S. Navy. "They have very powerful sonar systems that can be up to 10 times louder than what we exposed [the whales] to," Goldbogen says. The researchers found that mid-frequency sound can significantly affect whale behavior. The noise caused some whales to stop eating krill for up to an hour; other blue whales increased their swimming speed and swam away from the source of the noise. "It's important to note that not all of the animals responded — it depended on the individual whale and on context," Goldbogen says, explaining that whales feeding on the surface tended not to care about the noise. "[But] it's significant that we did find that blue whales are able to respond to mid-frequency noise." Feeding disruption, in particular, could prove especially detrimental to the whales' health. The researchers calculated that prior to the noise, the blue whales were eating some 19 kg (42 pounds) of krill every minute. When the mid-frequency sound caused them to stop foraging for 62 minutes, they effectively lost out on over one metric ton of krill, Goldbogen says. The amount of uneaten krill is equal to the whales' daily metabolic demands, though the scientists don't know what long-term impacts this loss may have on the cetaceans. At this point, it's also unclear what repeated exposure to these sounds does to the whales, or what harm actual naval sonar (with its higher decibel levels) can cause. "What's important is that this study highlights what little we know about how marine animals respond to anthropogenic sounds," Goldbogen says. Though noise from military sonar could certainly pose a problem to whales and other animals, there are a lot of other sounds polluting the marine environment. "As people concerned about the environment, I think we need to get more scientific information before we make statements about what we need to do to fix things." The researchers published the results of their study in the journal Proceedings of the Royal Society B. Top image via NOAA. Inset images via Ari Friedlaender, John Calambokidis.